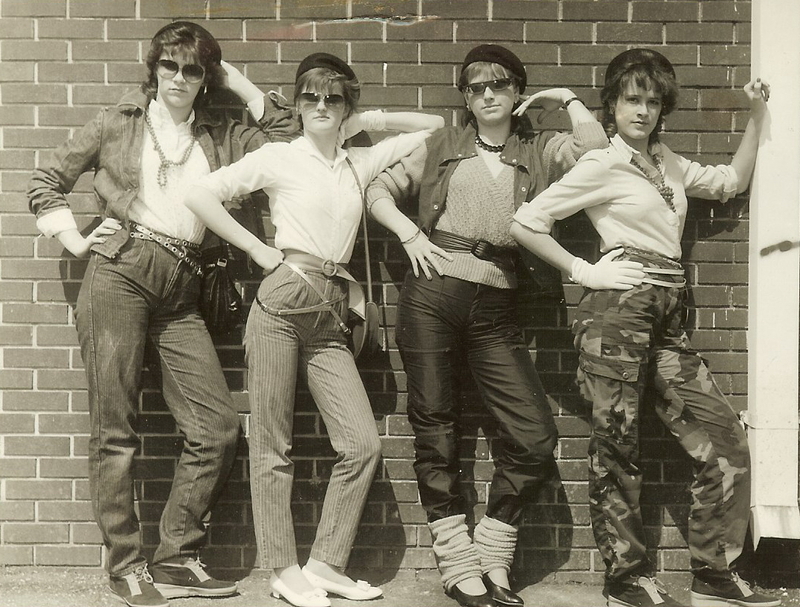 One of the questions today in the #NUTS Twitter chat was “What was YOUR most embarrassing fashion moment”. My response was 1986, senior year. Yes, the WHOLE year. Those who knew me back then can pretty much confirm this to be a fact. Although, back then, I was pretty rockin’. Take my prom dress, for example. Do you think mayyyybe I was obsessed with Molly Ringwald? Maybe? See my rat tail? That was so HAWT. You may also notice how my date is wearing a red, plaid bowtie. That is because my original date cancelled on me the week before prom. I had decided to simply not go to the event and just catch up with my friends afterwards. Then, I was hanging out with my buddy, Keith, the day before and the next thing I knew, he was trying on his dad’s tux and I had a date. I did not actually take this picture today (obviously), but I thought it absolutely post-worthy since so many memories came flooding back from my Twitter chat. (Besides, this is MY Project 365 and I can make up the rules as I go.) I couldn’t stop there. Oh, no. I thought, what the hell, let’s go for broke on this one. 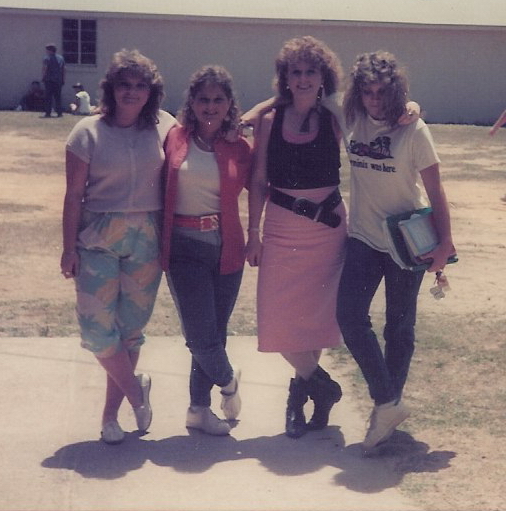 So, as a bonus, enjoy these other pics that totally define the 80’s for me, or should I say me, in the 80’s. 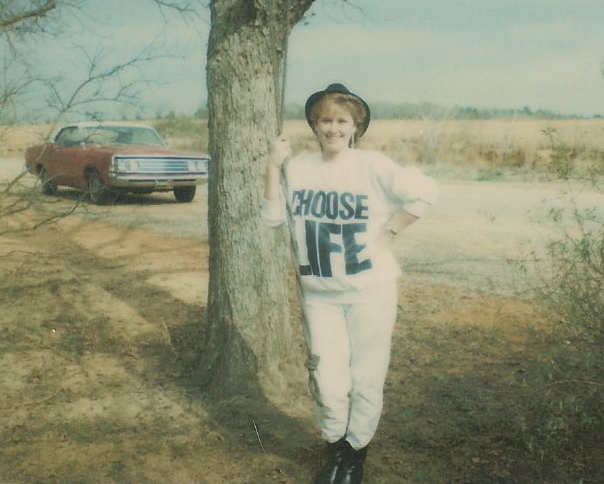 What self-respecting girl of the 80’s didn’t have a Choose Life sweatshirt? Ready for school. Yes, this was normal, everyday school wear for me. See, another classic shot from some random day in school. Notice the normalcy of the girls around me. Uh huh. I was THAT girl. 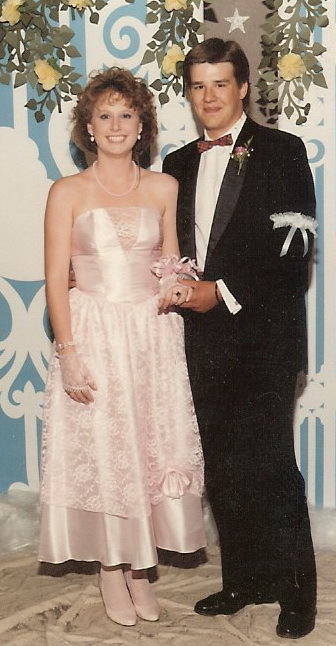 I was pretty sure my prom picture was my most embarrassing fashion moment, right up until the moment I found this gem in my photo box. What makes this picture so incredibly awesome is that we were just on our way to the mall. Yes, you read that right. We were just four teenage friends heading to the mall one summer afternoon, just to hang out. We were not posing for the cover of some future album cover. We were not getting ready for a Vogue fashion shoot *snort*. We were going to the mall, people. My mom worked for a newspaper at the time so I stopped by to get some moolah, which I often did, and the staff photographer thought we were awesome and wanted to take our picture. Well, that’s what we all thought but looking back now, I’m thinking it became the photo he used to show young children what NOT to grow up to be. I’m going to go into hiding for a little while now since I’m sure more than one of my girlfriends are going to hunt me down and beat me stupid for posting these. I have to start this post by clarifying that today, at this moment in my life, my husband is the person who makes my life worth living for. He is my rock, my guiding angel and my absolute source of strength. He loves me and takes care of me in ways I never thought possible. However, in the days before this amazing man came into my life, there was another. That is the person I want to talk about today. His name is Hunter Walker Love and he is and always will possess a very large piece of my heart and soul. He was born at 7:21 A.M. on December 26, 1995. It was in that moment that I understood what parents talk about when they talk about the love one feels for their own children. The problem with that is that I didn’t give birth to him, my sister did. Hunter has been the guiding light in my life since the first moment I laid eyes on him. I couldn’t wait to get my hands on him and when I did, it was hard for anyone else to get a turn. I was so lucky to spend so much time with him in the first week of his life. I really think that was the reason I formed such a special bond with him. The thing about baby Hunter was that he formed that same bond with all the people in his life, he just loved everyone and we were all so blessed to have him in our lives. As Hunter grew older, about 7 or 8, I had the wonderful fortune to move within walking distance to him. And boy did he take advantage of that. I can remember most Saturday and Sunday mornings I was awoken to the sound of his dirt bike jumping terraces in my front yard. He would do this until he saw my front door open. This was his not so passive way of checking to see if I was awake so he could come hang out with me. During those years there were so many phone calls from his mama asking “is Hunter there?” that I lost count. And yes, he was almost always ‘there’ with me. It was during these years that I was dealing with some pretty dark personal issues and bouts of depression. I can honestly say that this little boy was the driving force in my ability to get out of bed and maintain some semblance of being normal. He was my sunshine and the single thing that brought joy to my life. I could be at a devastating low point and hear the hum of that dirt bike flying down my driveway and it would change everything for me. He would bring light to all my dark places. 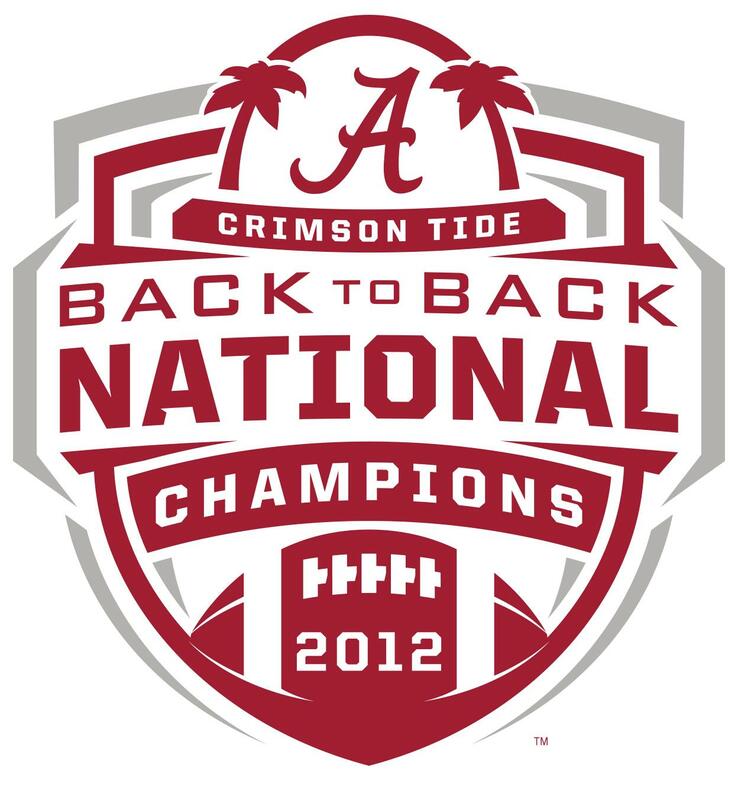 Several years ago I had the opportunity to move to Florida and it was the right thing for me to do at the time. I have to admit there has been a giant void in my heart since the day I left. I haven’t been as close to Hunter since I left Alabama but he is and always will be in my heart and my mind constantly. We talk and visit when we can and I always tell him how much I love him and that I miss him. I’m just not sure he understands how much that is. As he gets older and becomes the wonderful man I know he’s destined to be, I hope that he always remembers the special times we shared. I hope he always knows how much his Aunt leelee loves him. As I started thinking about today’s topic, I realized how little routine I have in my life. I guess it’s no wonder if you read my loving husband’s blog from yesterday. You know the one. He talked about his lack of routine. I guess the same thing can be said for me. But I decided to really pay attention to my day today and I came up with a couple of things I do, routinely, every day. I wake up and get ready for work. There is NOTHING about this that I enjoy. Ok, moving on. I get in my truck and drive to work. If there’s anything I enjoy less than waking up and mornings, it’s my commute. I hate it but it’s a burden I shall bear to have a job I truly enjoy doing. My days at work vary minute to minute. I never do the same thing twice. I have certain tasks that need to be completed on a regular basis, but our business is so fluid that I can’t plan or schedule those out on a routine basis. I just have to make time between everything else to make sure they get done. Suffice it to say, I have no routines at work. Oh, but wait a minute. I do have one. My lunch break. I thoroughly enjoy my ME time at lunch. I will almost always eat at my desk, door closed and my internet browser blazing. I use this 30 minute break in my day to satisfy my guiltiest pleasure. I read Rickey Stokes. What the heck is Rickey Stokes you ask? Well, you must not be from Southeast Alabama. Rickey is this guy back in my hometown of Dothan, Alabama. He calls himself a journalist and has a press pass and reports the news. However, all three of those descriptors are very liberally applied. VERY! Gil often refers to www.RickeyStokesNews.com (RSN) as the TMZ of Dothan. I suppose this is why I love reading the site and why I can’t stand to miss a day. I don’t know Rickey personally and I have no idea how or why Rickey began reporting the news. I do know from reading his website that he is a former coroner who now owns a bail bonding company. He has a house on Lake Eufaula at Hardridge Creek and seems to spend a lot of time there with friends and family. I first started reading his site several years ago when I was directed to go look at pictures of a traffic accident. Yep, you read that right. Most of the stories on RSN contain photos of wrecked cars, whether it be little fender benders or full on fatality scenes. I have to note that Rickey does NOT post photos of people or bodies from these accidents, but he will turn all paparazzi on you if you commit a crime and find yourself arrested. Rickey is considerate of the families of these victims and holds out posting photos and names until the next of kin has been notified. If you are interested in checking out RSN, be warned that some of the stores are not for the faint of heart. Rickey and his league of staff report on the local news which often includes commission meetings, car wrecks, structure fires, edged weapon assaults, drug round ups and dead bodies. And those are just today’s headlines. Rickey is often found ranting and raving about local and state politics. This is what keeps me coming back for more. Rickey even has a section called Hunt ‘n Fish where readers can submit photos of their most recent wildlife carcasses…er….trophies. If you capture an albino turkey with your cell phone camera, the first place you are going to want to share that is on RSN. There are some days I find myself laughing out loud at Rickey’s mockery of a city politician. On other days I may fly into a fit of outrage over the anti-gambling policies of my former home state. I know what it is about this lunchtime ritual that brings me joy and I may have to look past the opinions, gossip, dead animals and gross misspellings to find what I’m looking for, but I do find it each and every day. Every day Rickey manages to provide me with a piece of home. Even though I now live hundreds of miles away, it’s nice to know my daily routine keeps me in touch with the place that for me will always be home.